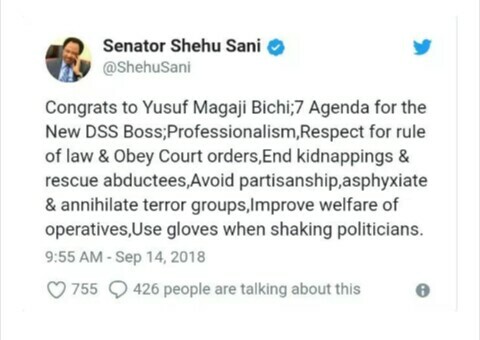 Senator Shehu Sani has advised the new director-general of the Department of State Services (DSS), Yusuf Magaji Bichi, to be cautious of politicians. The lawmaker gave the advice in a congratulatory message to the new DSS boss via twitter on Friday, September 14. He also urged the new director general to respect the rule of law, obey court orders, end kidnapping in the country and improve welfare of operatives among others. Meanwhile, the appointment of Yusuf Magaji Bichi as the new director-general of the DSS is generating mixed reactions from Nigerians across different social and political divides. While some believe that the appointment is a welcomed development, premising their argument on the competence of the new DG, others accuse the president of tribalism in his choice of the new DG.